DUBAI, UAE, October 29, 2018 /EINPresswire.com/ -- Understaffing and underinvestment place ICS security under constant risk in the MENA region, with over 40% of the region’s ICS computers facing cyber-attacks every semester [Kaspersky]. Several industries suffer the consequences of this cyber crisis: Transport & Logistic companies dread the reputational damage following a cyber-attack, while Chemical, Energy, and Oil & Gas enterprises worry about production halts and physical disasters. In short: cyber threats are keeping the region’s security leaders awake at night –and not unreasonably so. With this in mind, Qatalyst Global is pleased to announce CS4CA MENA 2019, uniting the assistance and expertise needed to protect MENA’s critical infrastructure against cyber threats. 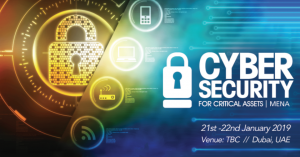 The 13th in a successful global series of Cyber Security for Critical Assets Summits will be in Dubai, January 21st-22nd, to focus exclusively on the Middle East and Northern African Regions.